“Once you’ve grasped the recipe for wholemeal bread you’ll never stop making it” was something I heard a long time ago and it’s true. This easy recipe make two small 450g loaves or a single 900g one. 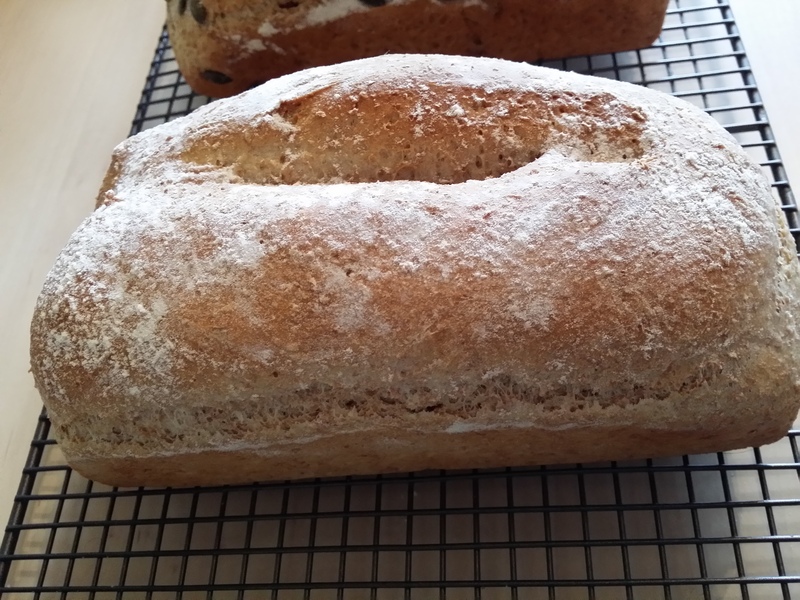 As it doesn’t contain any of the flour ‘improvers’ and preservatives that you find in commercially bought loaves, it won’t last as long, so I normally make two small ones and wrap one tightly and pop it in the fridge to keep for a day or two. Add the wholemeal flour and salt and stir. Rub the butter into the flour mixture and make a well in the middle. Mix the activated yeast liquid and enough of the remaining water into the flour to make a soft dough. Turn out the dough onto a lightly floured surface and knead for about 10 minutes or until smooth and elastic. Shape into a round an place in a clean large and lightly oiled bowl, pop into a large plastic bag or loosely cover with oiled cling film and leave to rise in a warm place until doubled in size. Oil two 900g loaf tins. Once the dough as risen (You can tell if it’s fully risen as the dough won’t pop back when you press your finger lightly into it), knock it back on a lightly floured surface, divide into two (if you want two loaves), roughly shape into rectangles and pop in the tins. Cover and leave to rise again, for about ½ hour or until doubled in size.